Just say no to recycling? Why every business need to beware. Even in our digital universe, many businesses produce a large amount of paper waste. And while recycling may seem like the ideal solution to disposing of it all—the fact is there are many implications to implementing a recycling program that could pose risks to your company. As a business owner, it’s likely you empower your staff members to manage any number of important tasks that keep your company running smoothly. 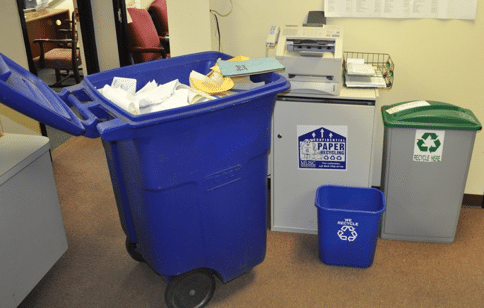 But when it comes to recycling documents, you may want to think twice about leaving the decision on which paperwork gets shredded versus recycled up to your team. Because although employees often take pride in recycling old documents to help the environment—it’s not uncommon for documents containing confidential information to end up in the bins, which can become a liability for your organization. Employee information, social security numbers, etc. To protect your business from possible risks, including a breach of confidential information that could lead to a myriad of legal issues, it’s best to implement a shredding program. Partnering with a waste management company to shred your documents onsite can ensure that they never end up in the recycling bin or the wrong hands. You can arrange to have your unwanted documents shredded on a regular basis and tailor your service based on the amount of paper waste your organization produces. And, when it comes to recycling, your best bet is to allow your staff to recycle only plastic and cardboard. 772-287-4152. We’re locally-owned and operated and serve a diverse array of commercial clients in Broward, Palm Beach, St Lucie and Martin Counties.